I absolutely love this platform bed. I switched from a mattress with a box spring to this, I sleep better and its easier to make the bed. I would suggest this item to a friend. I even posted it on my facebook. Make your bedroom feel complete without the need for an expensive and cumbersome box spring - this high-profile, wing-backed bedframe will set the scene and provide the perfect backdrop for your sleeping area, imparting a sense of sophisticated grace to your home. 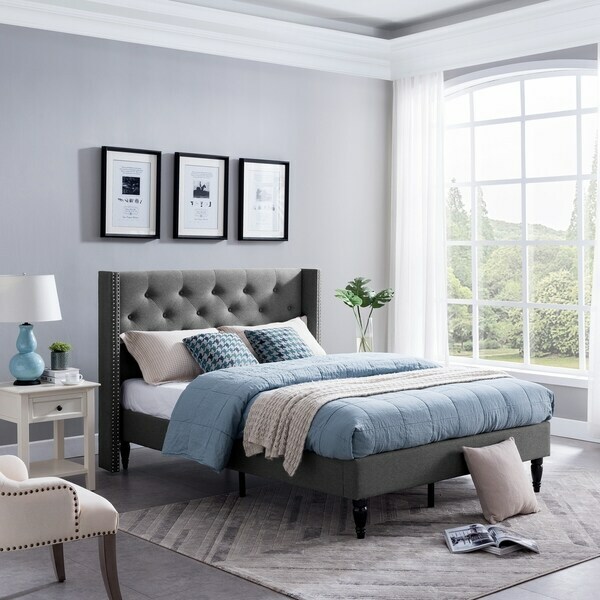 Boasting ever-stylish features such as fashionably-understated button-tufting and hand-placed nailhead accents accentuating either side, this selection will add an air of polish to your space that will have you wondering how you ever went without. Dimensions 83.5 In. X 65.0 In. X 48.0 In. The bedframe is as beautiful as they look in photos. We really love it. The downside is the assembly (thus, the minus 1 star). Otherwise, we would have given it 5 stars all the way. For some reason we had such a hard time attaching the side panels to the headboard. They definitely don't fit like a glove. We had to tilt it up first to screw the top portion halfway in for the screw to bite then push it down to finish screwing everything in. Also, unless we just missed them because it does not say in the instructions, there is 1 extra label 1 and label 5 bolts (just fyi). The bedframe itself is beautiful though. We're very happy with our purchase. We love it once we're able to assemble it. Quick shipping. Great purchase for the price! The bed was more sturdy and has a good amount of weight. We were very surprised and assumed it would be around the same quality of a similar bed ordered for our daughter. This one is great for a teen boy or a couple starting out on their own. We highly recommend this product. 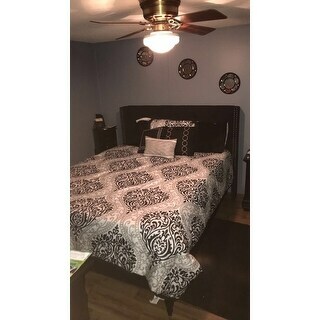 Looks wonderful, sits higher than other platform beds. Good material.Slides on hardwood floors. Took about an hour to put together 2 people definitely recommend.Other than that would give 5 stars. So far so good.. Frame looks good.. it is also easy to install.. it took me a 2 to 3 hrs.. I look forward to seeing how long it would last.. I know the aluminum support will give away from previous experience but those can always be replaced. The jewels on the sides are awful. Missing some and just look very sloppy. Also the side posts will not stay on. I am pretty disappointed. This Included a 90 day Manufacturer warranty. You can add an additional 5 or 10 years at checkout. "how high off the ground is this bed? Can I use the under bed space for storage of suitcases?" Looks like you can see all!! Approximately 9.25 inches and yes it may be used to store boxes if they are within the height limit.